I HAVE partnered with numerous local and international brands to create custom content, recipes and products. It was an entertaining project creating recipes for babycakes to match four different cocktails made with Hayman’s gin and Fentiman’s tonics for a special tasting event. Gin and cake makes a perfect union, might I say. Recipe creation is one of the best parts of my job, especially when I have delicious ingredients as my muse. Ricotta is one of my favourite things to bake with, so when Perfect Italiano approached me to write some recipes using their product, it was an easy yes. I developed recipes for passionfruit and ricotta cheesecake, hazelnut espresso and dark chocolate tart, and triple berry ricotta cake. 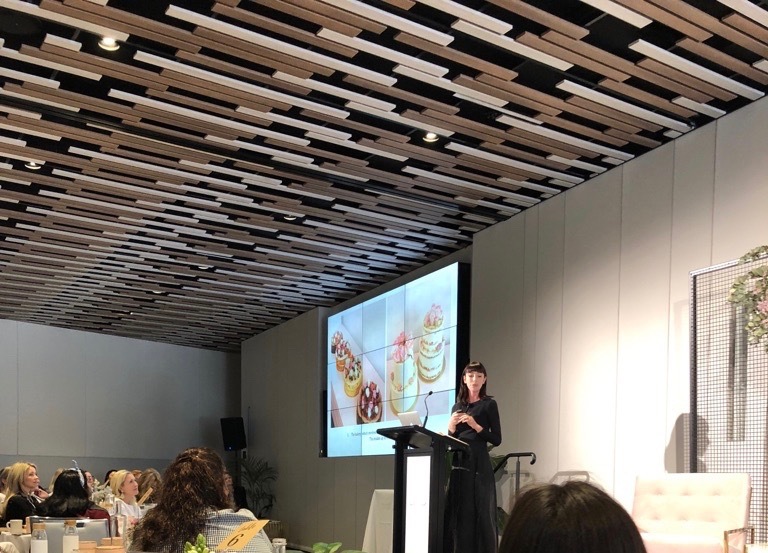 I was hugely honoured to be asked to be part of the Commonwealth Bank of Australia ‘Women In Focus’ conference held in Byron Bay in September 2018. I told my story about founding and growing a small business in front of over 200 incredibly inspiring and entrepreneurial women, which while nerve-racking, was a very empowering experience. Being part of ASB’s small business campaign in 2018, alongside some other very successful and inspiring founders, has brought huge exposure to The Caker by way of billboards dotted across the country, radio ads and social media content. Karen Walker and I have a well-cemented relationship (my first ever job was in her Ponsonby Road store) that blossomed in 2017 with our Limited Edition Peanut Butter and Dark Chocolate cookie mix, which was a huge hit, selling out in just three days. Since then we have re-released that first cookie, created another, and opened a pop-up Caker inside Karen's flagship Newmarket store. To celebrate the release of our Flourless Dark Chocolate Cake Kit, I made a series of little videos, where I visited some of my favourite local chefs and watched them transform the cake into crazy desserts. In this pilot episode, I join Chef Al Brown in his test kitchen where he creates something so delicious that it's hard to believe a cake kit could be the base of it. Next up in my series baking with my favourite NZ based chefs, I visit Giapo in his test kitchen. He uses his incredible molecular skills to turn our Flourless Dark Chocolate Cake Kit into an ice cream based dessert. It ends up a little messy but a lot delicious. Collaborating with COYO and experimenting with their decadent coconut yogurt resulted in a recipe, that out of my whole repertoire, is one of the ones I’m most proud of - Vegan Rhubarb Apple and Cardamom Cake. I also hosted a masterclass alongside the founders of COYO, so I could demonstrate how to incorporate this heavenly ingredient into baking. The Caker's ongoing relationship with premium dairy brand Lewis Road Creamery has seen us collaborate numerous times over the last three years. I've created custom recipes for a number of Lewis Road's gourmet products, but my favourite would have the be the Blackberry and Peach Cobbler cake I made to pair with their Double Cream Vanilla Custard. After fostering an ongoing brand alliance since the beginning of The Caker (my first ever stand mixer was a kMix), I became an ambassador for respected appliance purveyors Kenwood in 2016. As well as hosting regular private Masterclasses at Kenwood's Auckland showroom, I also create recipe content for the brand, which you can find here. Before New World's Little Garden initiative, I wasn't much into gardening, but when I was approached by the high-end supermarket to create recipe content with the collectable seedlings, I realised gardening is actually so rewarding. I grew some ingredients to create a special recipe with. I was asked to take part in Little Bird's Plant Based Challenge alongside some incredible chefs including Simon Wright, Michael Meredith and Nadia Lim. We all took the challenge to make an entirely plant-based dish to be added to their menu for one week. I made a Spiced Banana and Date Loaf with Coconut Yoghurt, Honey Orange Marmalade and Almond Butter! Luxury raw, organic chocolate brand Pana approached me in 2017 with a collab idea to create custom minicakes in two of their incredible flavours; Wild Orange & Fig and Sour Cherry & Vanilla. I was immediately in love with the flavour pairings and created 2 vegan recipes which remain to be at the top of my repertoire. I host a number of masterclasses every year, however one of my favourites would have to be when Fisher & Paykel sponsored a series of ticketed events, including a live baking demonstration by myself for 80 guests at the Fisher & Paykel Theatre. The event was a part of Restaurant Month 2016 and I was honoured to be included. You can see their full line up of incredible chefs from the events here. Deadly Ponies announced their collaboration with My Little Pony in mid-2017 and approached The Caker to make some all-natural rainbow babycakes for their launch party. Using freeze dried strawberry, passionfruit and plum powders, as well as Matcha powder, we provided hundreds of cakes for all the invitees. Definitely one of the coolest parties we've done.